Cretacolor’s Monolith Woodless Pencil is made with the purest graphite from Austria, formed into a 7 mm solid stick with a protective lacquer coating. Artists are thrilled by the broad and fine strokes that can easily be achieved with only one pencil. Densities range from HB (medium) to 9B (extra soft). Pencils are pre-sharpened. 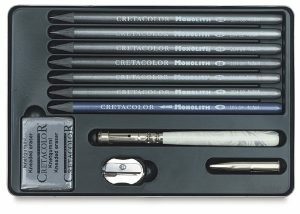 Set of 11 — This set includes the following materials in a sleek tin metal case: Seven Cretacolor Monolith pencils in different densities, a marbled monolith extender with cap, a water soluble 9B Monolith pencil, a metal sharpener, and a kneaded eraser.